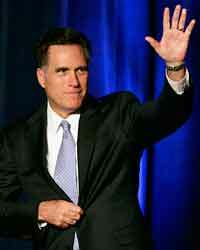 Mitt Romney, former Governor of Massachuetts, has retired from the 2008 Presidential race. Romney is a Republican and was competing against John McCain, Senator from Arizona, and Mike Huckabee, former Governor of Arkansas, for the privilege of representing the Republican Party in the general election for President in November. Initially it was believed that Mitt Romney was the Republican Party’s best chance of beating either Clinton or Obama on the Democratic side in the general election. he understood the economy, backed the conservative policies of George Bush and appealed to conservative Republicans. That is, until Super Tuesday ended. In Super Tuesday voting, it was clear that Mike Huckabee had as much of a stronghold on conservative Republicans as did Romney and, in the end, Huckabee won (with McCain’s help beginning in West Virginia). Romney won the states of Alaska, Colorado, Massachusetts, Minnesota, Montana, North Daokata and Utah. However, Huckabee took the states known for their conservative appeal and the states many describe as the conservative base of the Repblican Party: the South. Huckabee won the states of Alabama, Arkansas, Georgia, Tennessee and West Virginia. In the end, Romeny emerged with about 50 more delegates than Huckabee but he fell short of convincing conservatives of the same ilk that he should be their choice for President. And that spelled doom for Mitt Romney’s campaign. what happens to delegates when their candidate drops out of the presidential race? conservative social agenda. So, don’t be surprised if, at the Republican convention in Minneapolis-St. Paul in September, some of Romney’s delegates swing to Huckabee.